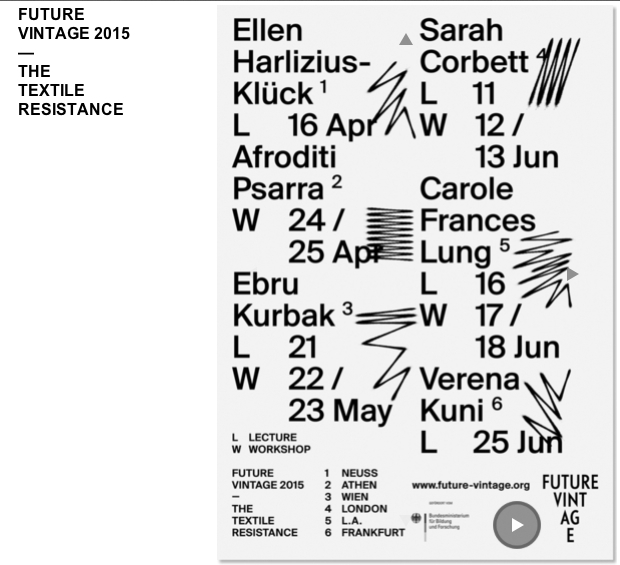 It’s an honour to be asked by Bauhaus University in Germany to be part of their Future Vintage 2015 conference entitled ‘The Textile Resistance’. Organized by research and artistic assistants and lecturers from three different chairs Katrin Steiger (MÖE), Martin Schneider (GMU), Manuela Hornauer (HCI) in close collaboration with students initiative Textilwerkstatt of Bauhaus–University. The series deals with the topic “Textile Resistance” in cultural, artistic and technological dimensions. Our Founder Sarah Corbett has been invited alongside six artists, textile activists and researchers which are all engaged with cultural, structural and/or electronical aspects of the textile medium in practice and teaching. We will spread our experience and knowledge with students of the Bauhaus in lectures and workshops. All information, dates and registration deadlines: www.future-vintage.org. Afroditi Psarra (Athen) // workshop: April 24./25. Ebru Kurbak (Vienna) // lecture + workshop: May 21.-23. Sarah Corbett (London) // lecture + workshop: June 11.-13. Prof. Carole Frances Lung (L.A.) // lecture + workshop: June 16.-18. Prof. Verena Kuni (Frankfurt) // lecture: June 25.